05/15/2015 Darling of the Day: Get Charlize Theron’s Forever 21 Jumpsuit Look! Oscar winner & style icon Charlize Theron is all over the place lately, promoting her new summer blockbuster, Mad Max: Fury Road. Not only is she making killer press appearances on all the best talk shows & hitting the Cannes Film Festival in true Hollywood glamour, but she’s also wowing fashion critics with her red carpet style, including some affordable pieces from Forever 21 & Adidas. We can all get inspired by Charlize’s laid-back ensemble, especially when traveling or spending the day running errands. Get the most out of your wardrobe by layering favorites for optimal comfort & style. 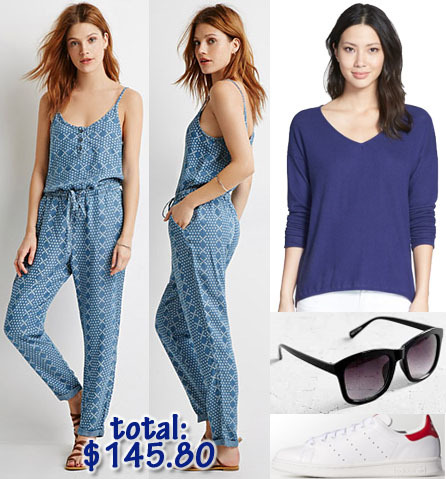 SHOP: jumpsuit ($34.90) @Forever 21, sweater ($19.90) @Nordstrom, sunglasses ($16.00) @Urban Outfitters, & sneakers ($75.00) @Adidas. For more stylish posts of celebrities-inspired outfits, check out Rosie Huntington-Whiteley, Reese Witherspoon, Natalie Portman, Emma Stone, Chloe Grace Moretz. Jamie Chung, Olivia Palermo, & Emmy Rossum. Happy Styling! This entry was posted in Accessories Access, Basics for a Bargain, Darling Of The Day, Luxury Look-Alikes For Less, Red Carpet Review, Show Me The Shoes, Splurge or Save?, Style Darling Daily, The $100 Challenge and tagged Accessories Acces, Adidas, affordable fashion, Basics for a Bargain, celebrity style, Charlize Theron, Darling of the Day, designer, fashion, Forever 21, jumpsuit, Luxury Look-Alikes for Less, Mad Max: Fury Road, Nordstrom, Red Carpet Review, Show Me The Shoes, Splurge or Save?, style, Style Darling Daily, style for days, style icon, The $100 Challenge, Urban Outfitters. Bookmark the permalink. ← #RedCarpet Review: Every Look From The 2015 #MetGala, Featuring Beyoncé, Jennifer Lawrence, Sarah Jessica Parker, & More!